Having collected the car from Zagreb airport, we set off for Sibenik, a town near the world famous Krka National Park and a drive of about 3 hours. Or so we thought…As with many Mediterranean climates at the height of summer, forest fires are an ever present threat. Earlier that day 8 teenagers had been arrested for deliberately setting a small area of forest on fire, which soon became a big area of forest. Unfortunately for us and the thousands of other cars heading south towards Croatia’s popular coastal destinations, this meant the authorities having to close a whole section of highway and everyone having to take a little country road the whole way. Revised drive time: 8 hours. Still, the nice thing about being off the highways is you get a better sense of the country you’re driving through. Croatia’s countryside is scattered with fruit sellers, lavender stalls and olive trees, winding through scrub mountains, vineyards and small villages and towns. 8 hours is a long time, but it’s a heck of a lot less taxing when you’re somewhere this beautiful. Eventually we made our way down to Sibenik, which sits roughly half way down the Croatian coast and is more seen as a pit stop that a destination in its own right. That said, it is a great pit stop…a big mall, plenty of well-priced accommodation and a pretty old town, with a little bay for swimming. 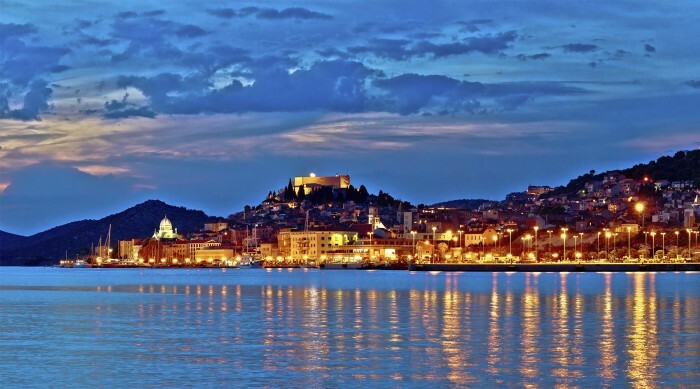 It also manages to escape the huge numbers of tourists swarming Croatia’s more fashionable towns, meaning the Sibenik’s main sights are refreshingly free of people. 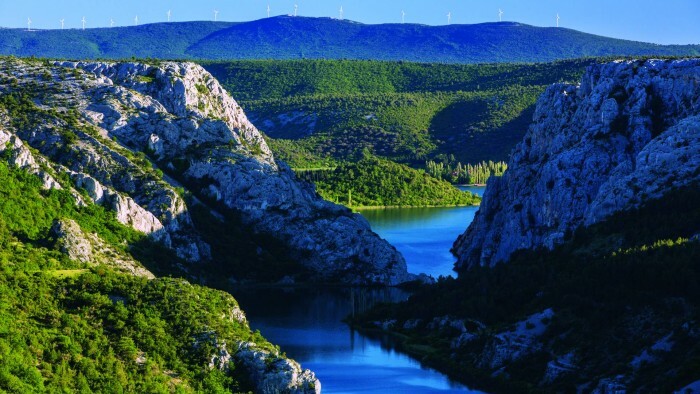 Sibenik is situated around a 20-minute drive from the hugely popular Krka National Park – a sort of vast green, waterfall oasis in the middle of a fairly dry scrubby part of the country. When planning a Croatian roadtrip Krka often goes head to head with Plitvice National Park, further north in the country. It’s hard to say why we chose Krka, perhaps just a hunch, but despite the vast tourist numbers, it didn’t disappoint. A useful function on Google for most big tourist spots is the ‘visitor number track’, which shows you how busy a site usually is at a certain hour, including live updates. We’d heard that Krka was extremely popular and that it was worth going either early in the morning or later in the day to avoid the hoards of tourist coaches which turned up from 11am onwards. We were slightly tired from the mega drive the day before and may have slept through the alarm…So, when we turned up at 11am, the place was already rammed. We chose to come back later in the day, around 5pm, and enjoy the final three hours instead, which turned out to be a masterstroke and a plan we highly recommend. Most of the coaches disappear at 3pm and whilst the park is always busy it’s noticeably less so in the early evening. The park itself is huge. 109 sq kilometres to be precise, meaning that you can only really scratch the surface in a single trip. Situated along the Krka River, its best known for a series of seven beautiful waterfalls, with nature trails, lakes, a monastery and ancient Roman catacombs too. The park boasts a unique ecosystem, which is home to many rare types of plants and animals. 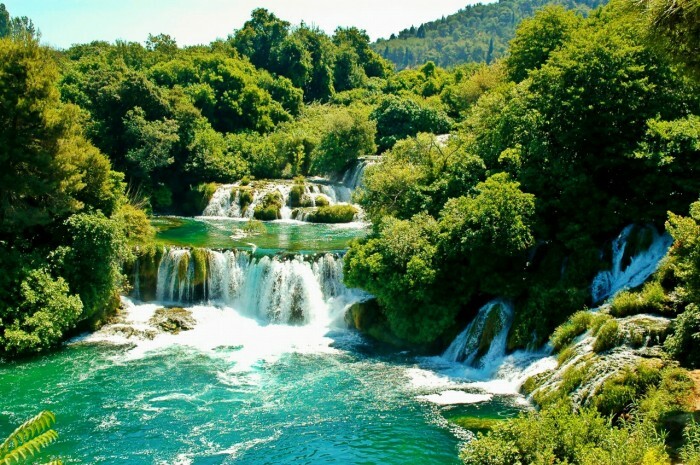 Eighteen species of fish inhabit the Krka River for example, among which ten are endemic. Tourists are taken down a winding road by coach to the start of a nature trail, which leads to a series of waterfalls and the public swimming area. Surrounded by beautiful hills and lush, green trees and reeds, it has to be one of the most incredible swimming spots in Europe, if not the world. Despite the tourist numbers, fish are everywhere, big fish too – such as trout, meaning that if you have a snorkel the place is simply magical. And once the sun sets over the ridge, the place virtually empties, meaning you more or less have this beautiful landscape to yourself. It really is a mini-Eden. Away from the more accessible spots in Krka, old wooden waterwheel boats take visitors on three hour round trips over the large lake, fed by the river Krka, whilst the never ending trails mean that you really could spend a whole week exploring the park and still not see anything twice. If heading to Croatia, definitely include Krka on your list. Hire a car, go later in the day (or very early), and plan which part of the park you want to visit. We're the Appletons, a British husband and American/Ecuadorean wife, who love to travel! Follow our adventures!